My friend’s Facebook post generated a bit of back and forth about whether GMOs are the answer to the food needs of humanity’s growing population. Some say yes, but this report from the Union of Concerned Scientists suggests otherwise. In short, “The biotechnology industry has been promising better yields since the mid-1990s, but Failure to Yield documents that the industry has been carrying out gene field trials to increase yields for 20 years without significant results…. 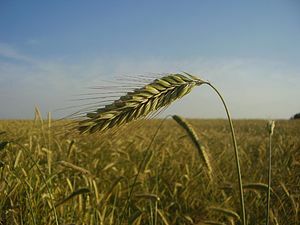 In addition to evaluating genetic engineering’s record, Failure to Yield considers the technology’s potential role in increasing food production over the next few decades. The report does not discount the possibility of genetic engineering eventually contributing to increase crop yields. It does, however, suggest that it makes little sense to support genetic engineering at the expense of technologies that have proven to substantially increase yields, especially in many developing countries. In addition, recent studies have shown that organic and similar farming methods that minimize the use of pesticides and synthetic fertilizers can more than double crop yields at little cost to poor farmers in such developing regions as Sub-Saharan Africa.” You can find an overview, FAQs, responses to critiques, and the full report here. It’s the sort of restaurant that would do well in Madison. A locavore spin on the Noodles and Company model, the space is stylish but casual. You order at the register; get your water, pop, and coffee from the self-serve stations; place your number on your table; and wait a fairly short time for staff to bring your meal out. Given the locally sourced veggies and humanely and sustainably raised meats, eggs, and dairy, the prices are reasonable; as is common with quick-casual restaurants, there’s no tipping. I’ve been here several times in the past for dinner, but this was my first brunch outing. Thinking of J who wasn’t along on this trip, I ordered the eggs Benedict, which is a favorite of his. I also added a side of sausage sourced from Dean Family Farm, which raises the heritage Red Wattle breed southeast of Cincinnati in Georgetown, Ohio. The sausage was tasty but a bit overcooked. The eggs Benedict, though, were amazing. As you can see in the photo (which I remembered to snap after sampling a bite), I ordered the hollandaise on the side, which was a good choice as the sauce was on the heavy side, and the dish was full of wonderful flavor without it. 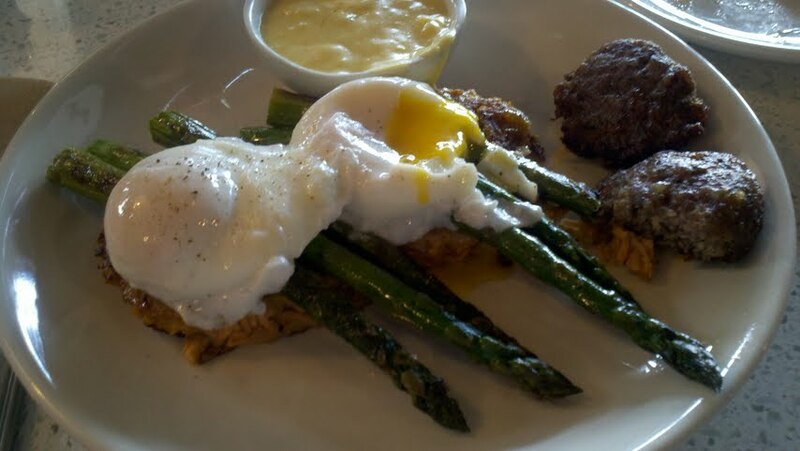 Instead of the traditional English muffin, this Benedict was served on sweet potato pancakes, along with spears of perfectly grilled asparagus. Yum!!!!! I owe J brunch at the Green Dog the next time we’re back in Cincinnati. For this week’s meals, we mostly made quick and easy stuff that we’ve made before, so nothing too exciting to report, with one exception. 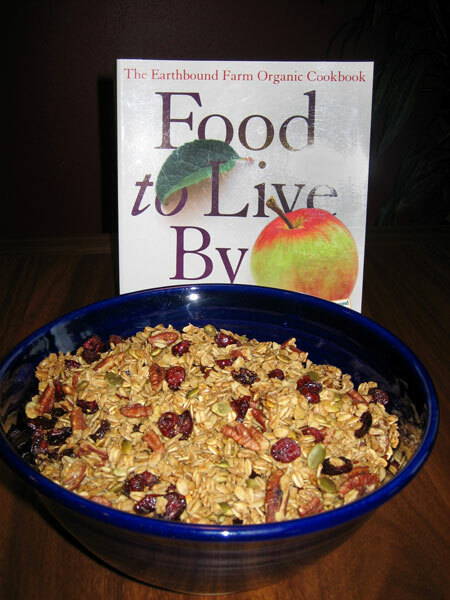 I decided earlier in the week to try making granola for the first time. I read a bunch of different recipes online, but many of them seemed like they had a lot of fat (in the form of oil or butter) and/or a lot of sugar. In the end, I decided for our first attempt to go with a recipe from Food to Live By: The Earthbound Farm Organic Cookbook. Given the quantity of oats (4½ cups) and other ingredients involved, the amount of oil seemed quite reasonable (½ cup of canola), though the sugar content seemed a bit high (1 cup of brown sugar, plus ¼ cup maple syrup). In the end, though, I decided to just make it exactly as the recipe outlined, see how things turned out, and adjust the amounts of various components the next time if needed. The rest of the ingredients are nicely complimentary: pecans, shelled pumpkin seeds, dried cranberries, and a bit of dried orange peel. A little taste test of the result suggests it turned out great! And it was so darn easy to make. Whisk the oil, syrup, and some water together; pour it over the dry ingredients (except for the craisins, which don’t go in the oven); and bake on a rimmed cookie sheet until the oats are golden brown, stirring a few times while baking. Ours was done in just 45 minutes. I’ll be curious to see how long this batch lasts us, since both J and I will eat it every morning. I’m definitely looking forward to breakfast tomorrow, and to trying other recipes, too. Once we find a few that we like and get some containers for storing the finished product, my plan is make a double batch whenever we make granola to be the most efficient and keep us well stocked.